Supermarket brand IGA has kicked off a social media campaign for Valentine’s Day with a love-themed social response initiative. Implemented through Twitter the activity will surprise customers with personalised love songs for their ‘special someone’. 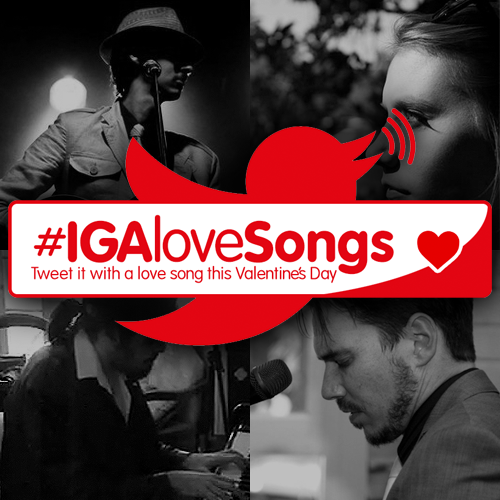 Through this social mechanic, Twitter users will be encouraged to tweet a message for their loved ones using the hashtag #IGAloveSongs and then local musicians will turn selected tweets into succinct, personalised songs which will be housed on Youtube and Vine platforms and tweeted back at the user in video form. Ram Bhat, national digital marketing manager at Metcash Food and Grocery sees this activity as a key opportunity to increase IGA’s social media presence. “Social media has been a focus for our digital team over the past couple of months. Having launched Facebook back in November we have grown to over 35,000 likes. “With the Valentine’s Day theme, we saw there was a gap in the market for an interactive campaign like this in Australia. It’s something very unique and provides an opportunity to continue to build an organic community,” he says.